Talking of sales, Henry Ford famously declared that the Model-T buyer could choose “any colour, so long as it’s black.” Thank goodness that these days, consumers are more discerning! This month I’m going to take you on a multi-coloured journey around the world. We start off in Fiordland, on the South Island of New Zealand where we had an early start for our journey to Doubtful Sound. A storm had been lashing the area overnight and, as I am a strictly fair-weather sailor, I was feeling rather nervous at this point. However, my fears were soon calmed, because almost as soon as we were picked up from our hotel, the skies began to clear, the sun came out and we were rewarded with this most spectacular rainbow! 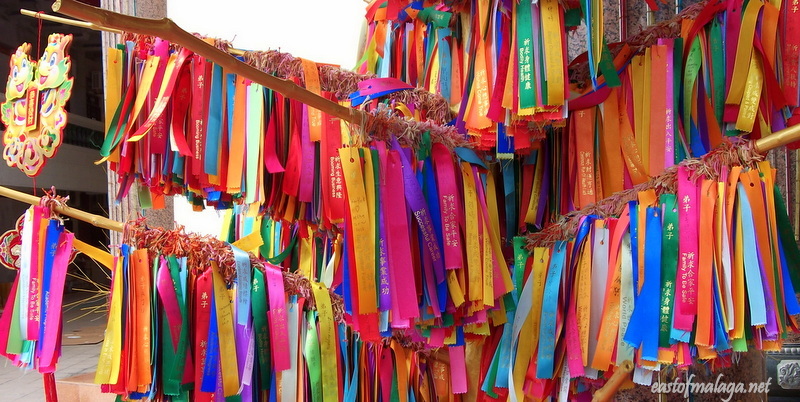 You can buy these multi-coloured ribbons in the main Prayer Hall at the Buddhist Kek Lok Si Temple in Penang, Malaysia. All you have to do is write your prayers onto the ribbon and hang it on the prayer tree. Sixty miles northwest of Ho Chi Minh City in Vietnam is the Great Temple, the centre of the intriguing Cao Dai sect. Cao Dai is a Vietnamese religious movement that incorporates aspect of Buddhism, Taoism, Confucianism and even Catholicism. 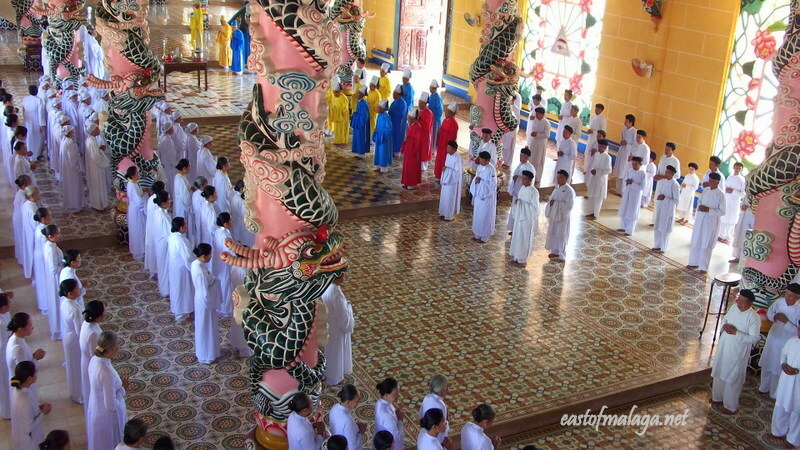 The three principal colours of Cao Dai are yellow (for Buddhism), blue (for Taoism), and red (for Christianity), and these were evident during the noon ceremony, which I was fortunate enough to witness – along with hundreds of tourists and worshippers alike. 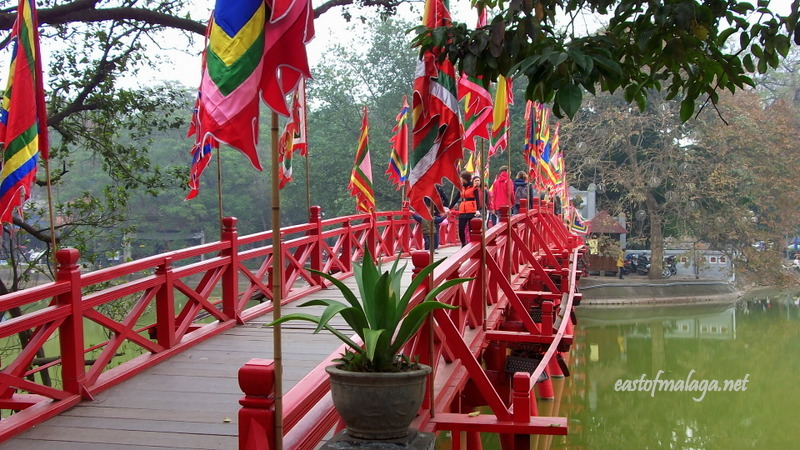 We stayed in the Old Quarter of Hanoi, Vietnam, close to Lake Hoan Kiem, where we visited the Temple of the Jade Mountain (Ngoc Son Temple) by walking over the wooden red-painted Huc Bridge with its colourful banners. On White Night (Saturday 23rd February 2013) the entrance to Flinders Street Railway Station, Melbourne, Australia was transformed into a concert stage, with the whole facade of the building bathed in glorious multi-coloured light. It was magical! Finally, back home to the Axarquía region of Spain, east of Málaga, and during our evening stroll along the promenade at Torre del Mar I spotted this delightful coloured sunshade. ** I always enjoy visiting Madhu at The Urge to Wander because like me, she has a passion for travel. She posts the most exquisite photographs and tells us of places most of us can only dream about. Her recent posts, The Frozen Smile of the Bayon and The Captivating Children of Cambodia were particular favourites of mine because only twelve months ago, I had the opportunity to see those enigmatic, smiling faces for myself – both the stone ones at Bayon and the enchanting children, nearby. I’m sure you would enjoy reading all about her adventures. ** Cathy is A Nomad in the Land of Nizwa and describes herself as a pilgrim, a vagabond, and a wanderer who has discovered the art of living and working abroad, and is now hopelessly addicted. As well as teaching English at the University of Nizwa in Oman, she is a prolific blogger – outlining previous travels in China, Korea, Turkey and Egypt as well as many other places. I particularly enjoyed reading Cathy’s recent post about the tree-climbing goats she encountered on a walk she took with a friend. I’d love you to pop over and say hello. So that´s the CBBH Photo Challenge for APRIL, folks! This entry was tagged Australia, CBBH Photo Challenge, Europe, Malaysia, New Zealand, Penang, photography, Spain, travel, Travel theme, Vietnam, Weekly Photo challenge. Bookmark the permalink. I feel like I do not get so many of your posts……hmmmmm. Wonderful colors! I’m having the same trouble with many blogs I am subscribed to not appearing in my Reader. Come on WP – get it sorted out! I saw that someone mentioned about looking in the EDIT section of “blogs you follow”, but as far as I can see that only relates to receiving emails. I want them in my Reader! I know it’s complex sometimes! What a wonderful tour! Your photos are a spectacular reminder of our colourful world indeed. Thanks for bringing us into some memories of your global wanderings! I’m glad you have been able to share a couple of blogs that you enjoy visiting. So many people comment that the blog-love is a great part of the challenge. First of all, welcome to the CBBH Photo Challenge, Cathy. I loved all your photos but I was blown away by the multi-coloured boats in Nepal – stunning! What stunning houses, Meg. You’ve really captured them beautifully. This is a very good theme Marianne, and your photos are so vivid and bursting with joy. I hope you will like mine. I do like yours – very much, Paula. Hi Gilly – welcome back, you’ve been missed! There are such wonderful colours, sights and scents in Morocco, aren’t there? And, you have captured the essence of Marrakech beautifully in your photos, Gilly – well done! Great entry for this month’s CBBH Challenge! Hi there, You have some great multi color shots!! Here is my entry for the month! Hi there, and welcome to this month’s CBBH Photo Challenge. Thanks for sharing links to two other blogs you enjoy visiting. I enjoyed visiting them both. Thanks Marianne, I really enjoy your challenge. I make a point to comment and read new blogs for your challenge. I guess I can finally say I am part of a community! You took the words right out of my mouth. It took me a while in the beginning to comment and introduce mysel.f and feel comfortable. Everyone is so kind and encouraging! 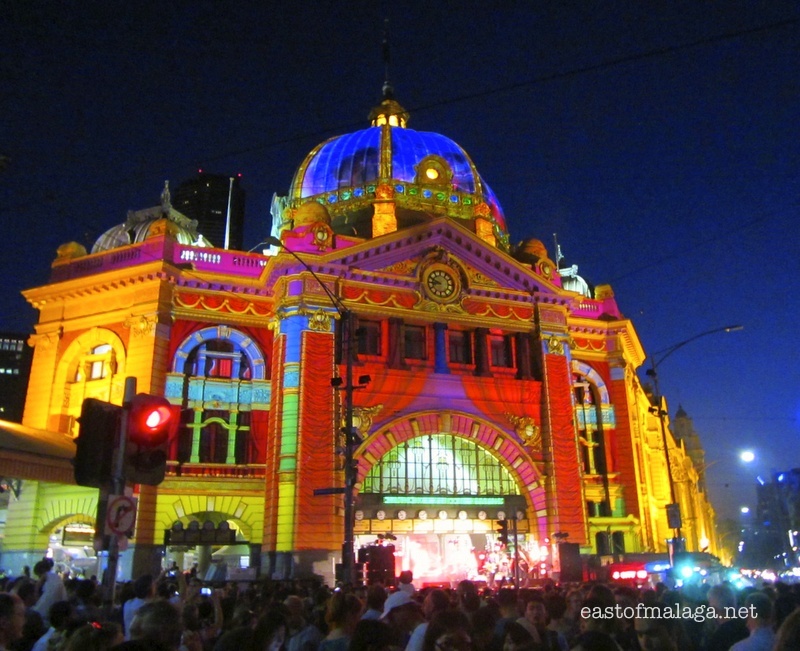 Yes, Flinders Street Station was looking particularly wonderful on White Night! I totally agree with you about having lots of colour on your plate, Christine. The more colourful the salad, the more I will enjoy it! Hey Debbie – what fabulous street art you have captured for this month’s multi-coloured theme. Serious talent. It’s lovely of you to take the time to comment – very much appreciated. I enjoyed my journey with you. Marvellous colours. I always enjoy your challenge, not least for the recommended blogs. It´s good to share, isn´t it? I’m seriously impressed at the creativity of your self-portrait project, Jo – what a very clever photographer you are. My favourite (contrary to others) is #39, but considering where I live, I’m sure you won’t be surprised! I’m glad you have chosen to highlight KIVA as a blog to visit – I’ve been lending through this scheme for years and I love the way it gives people a hand UP rather than a hand OUT. I too love following Lesley’s Bucket List Publications, and submitted an article which was published last year after I had taught English as a Foreign Language whilst travelling in Cambodia. Lesley is such an inspiration! We sure did have fun…the fur babies are still talking about it ! Thank you…all that praise will go to my head if I am not careful. So glad to hear that you like the photos. It is fun…most of the time, but I am learning a lot and enjoying it. I shall have to go find your article now. he he, I managed to put this together tonight, whee!! So the multi-coloured photos that look like jellyfish are in Las Vegas are they? Wow! I’ve seen that image before but didn’t know where it was. Love your selection of photos, Toby – I’m sure your red velvet cake was yummy! Thanks for pointing the way to two bloggers you have commented on – neither of which are familiar to me – so guess where I’m off to, right away? Great entry for this month’s CBBH Photo Challenge. glad you liked them! jellyfish? una perspectiva interesante 🙂 I’ve never seen jellyfish in there so thanks for that new view. Yep, it’s the ceiling in the lobby of the Bellagio Hotel by Chihuly. I had never heard of him before and had posted that photo on another blog at the time I took it and someone there told me who created it. A fun artist!! Thanks Toby – look forward to seeing your entry! Oh that is such a different view of the beach at Torre del Mar from what we saw a couple of months back in the middle of winter (and on a very rainy week-end too). 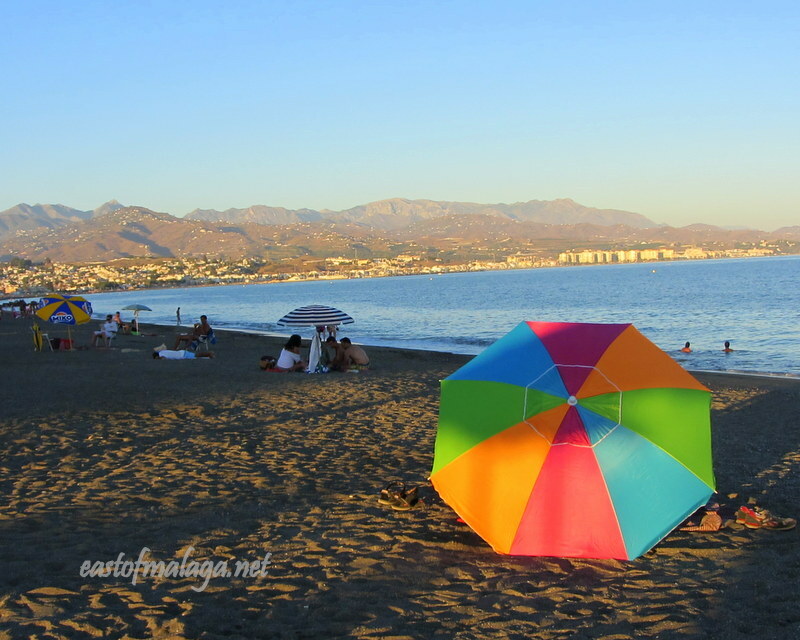 I love Torre del Mar – we visit often, and during the summer months it’s a much more touristy resort – though mostly Spaniards. We have discovered some great restaurants and tapas bars there! Thanks for taking the time to let me know. Much appreciated. I’m glad you liked it. My favourite would be the one of the bridge. The red colour really makes it stand out. Thanks for letting me know, Colline. The red bridge led to a very special temple to visit. It really does stand out, doesn’t it? Woonderful combined entry, Sylvia. I love, love, love the stall holder having a little nap in your first image! Thanks for linking to two blogs you enjoy – now we can all share them! The umbrella was most likely one of the best photos IMO ! I love that shot, too – and in fact I took a number of shots of it from different angles! It’s difficult to select a favorite photo. They are all very colorful, bright and historically significant. The multi-coloured ribbons in the main Prayer Hall at the Buddhist Kek Lok Si Temple in Penang, Malaysia are intirguing. Thank you for posting these fabulous travel photos. It’s a wonderful experience each time I visit. I wonder if my prayer is still on the tree, or if they have to be removed to allow room to be replaced? It was fun doing this month’s challenge! Thanks for saying so, Sonel. Colours make the world go around! Thanks for posting them, Trish – I’ve seen something similar projected onto the Opera House and Town Hall buildings in Sydney. It’s always good to share links to blogs we all enjoy – don’t you think? Great entry for this month’s challenge – well done! Loved the one of the ribbons! What a lovely selection of photos you have for us this month! I would love to sit for a while, enjoying a drink with friends in Neal´s Yard or take a stroll along Calle de los Suspiros. 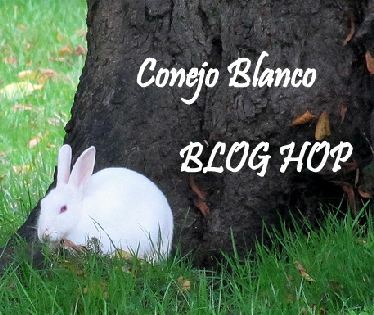 Thanks for sharing two blogs you enjoy visiting, Ana – I´ll HOP over there, right away! I’m quite dizzy and confused with the red ‘purple’ and all that colour, Marianne! When I saw the rainbow I thought you were alluding to the recent rain in Spain- or was it only the Algarve? Easily my favourite shot is the temple, which is, by comparison, subdued and calming. Maybe I’m a peaceful person at heart. No, it wasn´t only the Algarve – there has been heavy rain in Spain as well, Jo. I know what you mean – I tried to balance out the riot of multiple colours with the Cao Dai temple and the rainbow for a peaceful moment or two. Fab, colorful photos! I love the one of White Night in Australia. That looks like such a fun event. We spent a month travelling in Vietnam, and saw some amazing places. It´s a fascinating country. I hope you have the opportunity to take part this month, Pooja – the more the merrier! Beautiful, cheerful colors! Great selections, Marianne! The rainbow is an amazing shot. I loved the array of colours when the post was finally finished, and you´re right, Amy, they are cheerful, aren´t they? I was so relieved to see that rainbow because it meant that the sun was about to come out! Thanks Cathy – and you are most welcome. I always enjoy my visits to your blog, particularly in Oman. Beautiful colors! Excellent photos, as always. Vietnam is great for colours, isn’t it? I went to a Cao Dai temple in HCMC and took loads of pics. The use of bright colours is almost cartoon-like. Yes, you´re quite right, Julie – the colours were unreal! That rainbow is so vibrant! If you look closely, you can see traces of a 2nd rainbow to its left. Poor thing never stood a chance. Taken together your photos show us what a colorful world we live in. Thanks for sharing, Marianne. 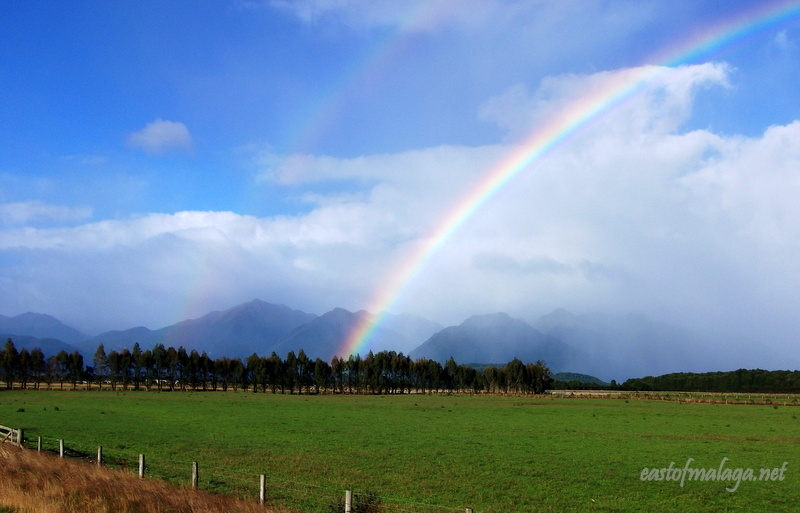 Ah yes, the second rainbow – well spotted, John! I love to see that effect. To be honest, I was so relieved that the storm had blown over for our trip across Lake Manapouri to Doubtful Sound, that I only spotted the second rainbow later in the day when I was looking at my photos on the computer.